Anasazi America – Done in by Climate Change – Are We Next? In the mid-1970s I was stationed at an Air Force radar site in Holbrook, Arizona. With a family of three young girls, Ellen and I explored the National Parks, Monuments and Reservations in the region. One of the issues that always pricked my intellectual curiosity was why did the Pueblo People leave their cliff houses and where did they go? We often heard of the Chaco Canyon People, but did not have time to visit the canyon before we left the area. When we lived in Omaha, Nebraska in the late 1970s we visited the Mesa Verdi ruins, often camping in the National Park gave us lots of time to explore the cliff houses and visitor center, seeking answers to our questions. After I retired from the Air Force, on our way home to California, we stopped once more to camp at Mesa Verdi, this time with a fourth daughter, almost three years old. Climbing pole ladders to the higher reaches of the cliff houses with a three year old under one arm was a challenge. Our oldest daughter, a sophomore in high school, was so impressed with the Pueblo Culture she decided to study Anthropology when she graduated from high school. Years later she graduated from UC Davis with a degree in Anthropology, after spending a year in England studying Archaeology. We often discussed the plight of the Pueblo People of the Southwest and concluded that the climate may have played a role in the migration of the Anasazi from Chaco Canyon, and eventually from the cliff house communities through out southwest. 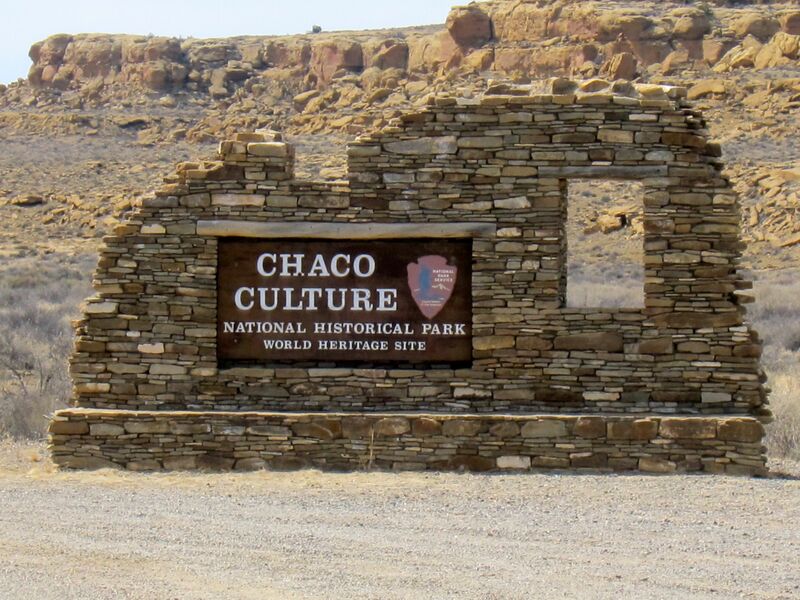 After I retired, Ellen and I put a visit to Chaco Culture National Historical Park on our bucket list. In the spring of 2013 we made the long trek to the Canyon, only to be disappointed by the lack of artifacts and information at the visitors center. We were told the artifacts were in the Maxwell Museum in Albuquerque, New Mexico. We did, however, take the opportunity to explore the great houses and the ruins at the Park. Again, we came away with more questions then answers. This fall we visited the Maxwell Museum Chaco Canyon exhibit, while at the Albuquerque Balloon Fiesta. There is not much balloon activity during the mid-day and we took the opportunity to explore the Maxwell Anasazi display, which was quite small. We had heard there were over 8,000 artifacts take from Chaco Canyon. Again disappointment was perched on the back of our minds. We asked the young lady at the gift shop for books on Chaco Canyon when we first arrived at the Maxwell. She said it would take some time to find them. After looking at the limited artifact displays we went by the gift shop to see what she had found, and there was a pile about 18 inches high on the counter for us to examine. Explaining my interest in climate change, the store manager recommended Anasazi America, Seventeen Centuries on the Road from Center Place, by David E. Stuart, a scholar at the University of New Mexico. I am glad we stopped at the gift shop and accepted the manager’s recommendations, as Stuart’s book has answered many of the questions I have puzzled over for years. After reading Anasazi America, I now have a much better understanding of the Chaco culture and the Anasazi migration in the Southwest and the huge role that climate change made in the lives of the people living in the region. And, it was climate change the led to their collapse. There were a number of factors that influenced the climate, but one critical factor was the summer monsoons. For long periods the monsoons came on a regular basis, then for long periods the monsoons became highly variable, and then vanished year after year for a longer period. From 900 to 1021 the rains were fairly reliable, with a spring mixture to germinate the seeds and July rains critical during the tasseling of the corn plants. From 1021 to 1051 there was a summer drought. Then after about 70 years of reliable moisture again, the drought returned in 1130 to 1175 and again from 1200 to 1299, an exceptionally long period. The two droughts with only a short recovery period between 1175 and 1200 resulted in the collapse of the Chaco Canyon Community. Unable to farm in the canyon, families fled into the highlands seeking water for their corn, beans and squash. In the second edition of his book (First edition was published in 1999) Stuart incorporated new research findings through some groundbreaking archaeology to explore the rise and fall of the Chaco Anasazi. Adding new research findings on caloric flows in prehistoric times as well as exploring the consequences of an increasingly detached central Chacoan decision-making structure. Stuart argues that Chaco’s collapse was a failure to adapt to the consequences of rapid growth–including problems with the misuse of farmland, malnutrition, loss of community, and an inability to deal with climatic change. One minor negative in this latest edition is an attempt by Stuart to show how Chacoan Culture parallels patterns throughout modern societies. He thinks that modern society could learn from the experience and fate of the Chaco Anasazi. If we do not learn from our Anasazi ancestors, he suggests we risk a similar cultural collapse? This comes across as unsupported progressive academic musings often found reverberating in the University Lounge after a few glasses of wine or tall beers. Avoid these cultural comments and you will be fine, as the archaeology is worth the time, just skip the sociology. If you are interested in historic climate change and Anasazi life in the Southwest, I recommend Stuart’s book. You can find a shorter version of life in the Southwest, focused more on the climate issues, in The West Without Water by B. Lynn Ingram and Frances Malamud-Roan. It is clear that climate change has an impact on society as a whole, depending on how the society adapts to change. One issues is the slow place of climate change, the change often takes place over generations. Religious leaders in the Chaco Canyon forecast the rains would return, and when they did not the farmers just walked away seeking a better life for their families where there was water in the highlands. When the farmers left, there was a cultural collapse. If long term drought comes to California, our dams are empty and the Central Valley aquifers drained, where are the people of the Central Valley of California going to go? There will be a cultural collapse, with great economic impact on the state and the nation. Our legislators are focused on global warming climate change, however the droughts came during both warm periods and cold periods. We have a better understanding of the forces of climate change that did the Chaco Canyon elites, and have the tools for monitoring the ocean temperatures and the shifting jet stream. We can anticipate, a cold PDO and AMO, which will being more dry cold weather, with intermittent El Niño floods. We need the political will to capture the water during those floods and use it for sustaining life in the Central Valley, not some bait fish in the delta, when a long term drought returns to the state. Long term drought has occurred in our past and will again. If there is one lesson we need to take from the plight of the Anasazi in the Southwest is that droughts are cyclical, they come regardless of human activities. We need to prepare for the next cycle. Next Article Questions: What we do not know about the climate? Wasn’t there a drought in parts of the US Southwest that lasted a couple of centuries? Roger Pielke Sr. had an article on that when his blog was still active. That would certainly do in a primitive society. I also wonder about the migrations in the bible. From what I understand, the earliest parts of Jewish history in the bible started out in the Tigris and Euphrates valleys. I also heard that part of the world was subjected to a 3 century dry period about 1500 to 1000 BC time period. Could it be that much of early Judeo-Christian history is about migration brought about by a changing climate? There was a Sierra drought that started about 6,300 year ago and ended about 4,800 years ago. Lake Tahoe was about 20 feet shallower than it is today. Falling Leaf lake, south of Lake Tahoe has stumps of pine trees that are over 200 years old. We are currently living through a relatively modestly warm and moist time in history. It has been much dryer in our past and will someday return to that mode. The history of climate in the Sierra is cyclical, wet, dry, wet and dry again. Since ii is wet now, we had better prepare for the dry yet to come. I highly recommend The West Without Water, What Past Floods and Droughts and other Climatic Clues Tell Us About tomorrow. Russ, A new federal report say’s, Don’t blame man-made global warming for the devastating drought in California. Here’s the link http://www.newsmax.com/Newsfront/California-Drought-Warming/2014/12/08/id/611850/ Posted on 12/08/2014. Happy Holiday’s to you and your family. Humans through prehistory and ancient history have had to pick up their most important belongings and head out for any other place where they may survive. Otherwise, our ancestors and all of us would still be in Africa. The story of human kind is the story of people picking up and trekking to somewhere else that had resources to survive. The Sahara was once wet and verdant, but it became desiccated about 5,000 years ago, as did Yemen and Arabia, Pakistan and the region that includes Jordan, Eastern Syria, Southern Iran and Western Iraq. On the other hand, rising oceans cause a breakthrough from the Mediterranean to a low lying region with a great fresh water lake to form the Black Sea (about 7,000 years ago). The Earth’s tilt cycles of 41,000 years, the Earth’s 100.00 year orbital cycles of elliptical eccentricity, the changing center of mass of the solar system that is sometimes inside the Sun and sometimes far outside of it due to the planets Jupiter and Saturn changing relative positions about the Sun, the Solar short cycles that are shorter and longer, all affect the solar radiation and temperatures on the Earth’s surface. These and the Earth’s spinning cause ocean currents and air currents that vary over the interacting cycles. Scammers and climatologists just fake the data and pretend to know about Earth’s climate, but don’t have a clue. The are good at using statistics and algorithms to fake the causes and mechanisms. CO2 is quite insignificant in all of the climate changes, but not one has ever done a valid experiment to show its effect one way or another. Oh, some typos: 100,000 year elliptical change of Earth’s orbit about the Sun!!! And what if an anthropologically informed sociology teaches us that every civilization in history has, eventually, “faced a similar cultural collapse”? It is certainly correct to state, even on present evidence, that many have, and also that if we consider today how any particular modern culture or civilization would react to these described circumstances it is not difficult to see how they would bring any culture to its knees. If we want to say that we are different, then how? I suggest that, ironically, the most important difference might be that we now have the data to understand what happened to these other civilizations, and therefore can still be instructed by their failure to survive. For this reason I must support Dr. Stuart’s right to raise these questions, and the pertinence of him doing so. I have just returned from reading sobering predictions that we are very likely on the verge of a new maunder minimum. We better start learning from the past quickly, and books like Dr. Stuart’s (based on this fine review) are helping us to do so. In my mind the result of such awareness is not classifiable under today’s “left” and “right” agendas. It is bigger than those labels. Thanks for the thought full insight. Yes, we are different in that we have knowledge of the past or at least our interpretation of the past. The problem is Do we have the political will to take action on the knowledge that the Southwest has experienced major long-term droughts that occur in a cyclical pattern. These droughts were not caused by anthropogenic global warming, they were caused by solar cycles and long-term changes in the Pacific Ocean circulation patterns. How there two major factor are connected is still and open question. Your thoughts? Good question. This is why, despite my fairly firm adherence to the “left” when it comes to questions of social justice, I support the discussion on this website, because it insists that we evaluate the idea of anthropogenic warming in a larger scientific and historical context, to see that there are many causes of climate variability, most of which we still don’t understand and can’t control, but which may well affect our future quite profoundly. Thank you for the opportunity to join the discussion.